America's Boardwalk, USA - The World Famous Wildwoods Boardwalk Sightseer Tram Cars began rolling today for their 70th consecutive summer! The original Tram Cars were custom built for the 1939 World's Fair in Flushing, New York. First introduced on the Wildwoods Boardwalk by local businessman Gilbert Ramagosa on June 11, 1949, with a one-way fare of $.10 cents, the Tram Cars are the defining icon of the Wildwoods and annually transport hundreds of thousands of guests up and down the two-mile Wildwoods Boardwalk. 2018 will mark the 70th consecutive summer that these people-movers have traversed the boardwalk, with their famous audible warning: "Watch the Tram Car, Please!" On Monday, June 11, passengers will get to experience the thrill of riding the Tram Cars for the historic price of just $.10 cents each way. Saved from bankruptcy by the privante, non-profit Wildwoods Boardwalk Special Improvement District, Management Corporation (WSID) in 2003, the Tram Cars continue to be the most recognizable icon, not just of the Wildwoods, but the entire region. 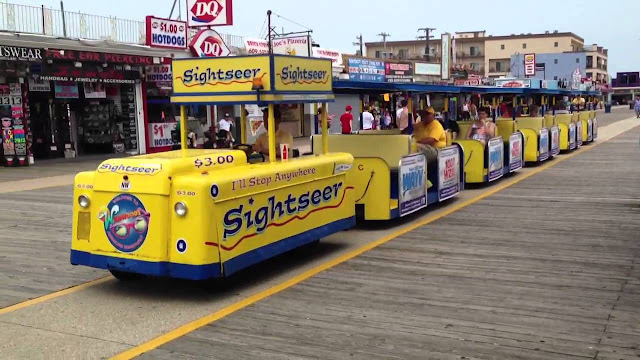 "The property and business owners who stepped up to make sure the Tram Cars would continue to serve the Wildwoods Boardwalk are proud that we have been able to keep this 70-year tradition rolling on our great boardwalk," said Ken Schwartz, President of WSID and third generation boardwalk property owner. New for 2018, a reduced Spring and Fall "all day and night" wristband will be available for just $5.00. Good from 11 am until the Tram Cars stop running for the evening, the "hop on/hop off" wristband will be sold up until May 24, and again in September after Labor Day Weekend. The one-way full priced fare has increased in 2018 to $3.50. That respresents a 3 percent annual increase since the last fare increase in 2013. However, customers are encouraged to take advantage of the many Tram Car ticket discounts that are available. Discount Tram Car tickets can be purchased at nearly a dozen locations along the Wildwoods Boardwalk. The average price paid for discount tickets is only $2.53.